I had the pleasure of meeting upcoming author, Ms. Inshirah Aleem, back in March 2012. We met to discuss her new book, She Smiles and Cries. I’d already spoken with Inshirah over the phone, and she gave me a general overview of her book/life as someone diagnosed with Bipolar Disorder. Nothing in her voice said to me “disorder.” In fact, she seemed very “orderly” and professional and … Well, this goes to show how much I knew (ignorance) about the disorder. It became even more baffling when I met with her in person at a coffee shop in Gaithersburg. I saw this lovely young author with a bright face and lovely smile walk towards the front door of the coffee shop. I figured it was Inshirah because she got out of the car that fit the description described by her over the phone. However, what I thought of as Bipolar Disorder and how it looked did not fit her description. Again, I was suffering from ignorance. What does Bipolar Disorder look like on a person? Well, by the time I finished talking with Inshirah about her book, her life, her family, and Bipolar Disorder I was on my way to becoming educated. I became even more educated as I started reading her book, She Smiles and Cries. The book is a collection of poetry and prose describing her life in battling Bipolar Disorder. I find her words to be courageous and inspirational. This work also counts as a testimony because she credits her Islamic faith and the help of the Almighty God (Creator) for her strength in this battle. Overall, She Smiles and Cries is a wonderfully creative work that I hope will inspire and help those who suffer from Bipolar Disorder. It is also a great book for those who want to learn about it. The poetry is also a fantastic read; more importantly, it is straight from the heart of a woman who wants to share her story to the world. I pray it reaches far and long. This is all in the hope that it will help others and possibly even save lives. In the end, you may smile, cry, and possibly become very educated. 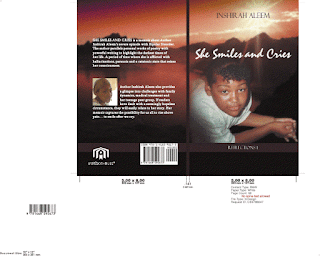 Bio: Author, Inshirah Aleem, was born and raised in Springfield, Massachusetts. She currently resides in Gaithersburg, Maryland. Inshirah has been writing since childhood. Poetry and prose have carried her through dark times. At the age of 15, she was diagnosed with a severe form of Bipolar Disorder. She writes to educate, inspire and challenge the stigma attached to mental illness. She is a spokeswoman for NAMI (National Alliance on Mental Illness),"In Our Own Voice," which is a program that provides a platform for individuals with mental illness to share their stories and educate people about mental illness. Nearly twenty years post-diagnosis, she has acquired a true appreciation for life and the humility to embrace her journey. She has been courageous in attaining high academic achievements and pursuing loving, stable family relationships. I'm definitely going to recommend this book to others, especially to family! I feel this book will help many who suffer from this disorder. Great testimony of victory and faith.